Headed into town for the weekend, and looking for something unique to do? Does DIY, tinkering and technology send you into whirlwind of excitement? 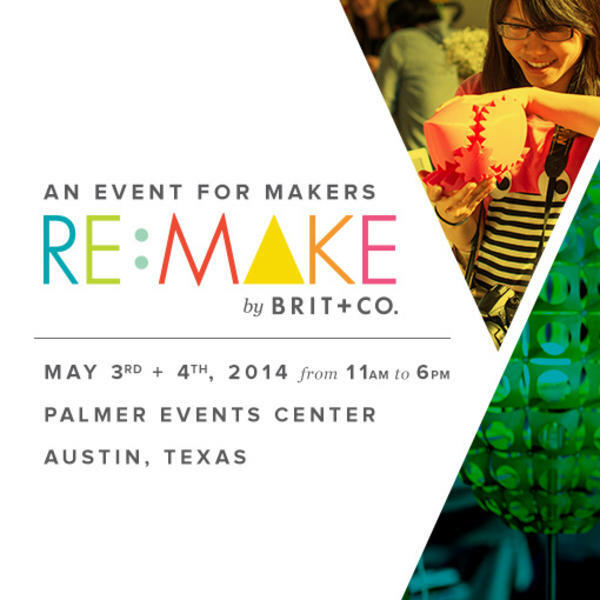 If the answer is yes, get ahead of the curve this weekend and experience Re:Make Austin by Brit + Co. May 3-4, 2014 at the Palmer Event Center. At this one-stop crafting event and forum, you&apos;ll be able to shop awesome handmade, innovative and out of the box goods from makers uniquely featuring Austin and our local artisan and entrepreneur community. Each maker has been hand-picked by the team at Brit + Co. and the quality and one-of-a-kind goods is unbeatable. You&apos;ll be able to network and talk to some of Austin&apos;s (and other) biggest designers, bloggers and crafty retailers from around the country, grab a special gift and also create something of your own.